“Whatever happened to Otto Nothling?” a friend asked. It sounded like the title of a Tennessee Williams play. Otto, it emerged, was the man for whom Bradman was dropped in the 1928 Test series. He didn’t do badly really, hitting eight and 44 and taking no wickets for 72 runs in 46 overs, but he was never picked again. To his dying day he swore that he should have played in the third Test in Melbourne rather than the second in Sydney because the MCG was wet and Nothling was a wet-wicket specialist. Once he dismissed Bradman for a duck on a soggy pitch and the old cricketer’s kindred spirits used to laugh about this later when they dined or played golf. Who was this extraordinary man? Otto’s origins were suitably colourful. His parents were German. They fled to Australia in 1870, having supported the wrong side in the Franco-Prussian War. Otto’s father left behind a rich estate just outside Berlin and a life of plenty. Penniless, their degrees not recognised, the Nothlings survived by making bricks. Later they cleared a forest to build a farm. Otto was born in Witta, in the Blackall Ranges of south-east Queensland in 1900. The youngest of eight children, he was sent to Brisbane Grammar and then to Sydney University because he was to be a medical student and Queensland had no medical college. Otto was the brightest of the children and some time it would be up to him to support the family. Otto quickly made an impact in Sydney. Standing 6ft 3in (190.5cm) in his socks he was a fit and gregarious man. He could run the 100 yards in even time and could jump like a kangaroo, so he was chosen to represent Sydney in the University Games. Out of the blue he was asked to throw the javelin. He’d never seen a javelin before and on hearing that practise throws weren’t allowed he asked if he could go last so as to observe the others. Casting an eye over the javelin he pronounced it a pretty good spear of the sort he’d used for sticking pigs, and proceeded to break the NSW, Australian and Australasian records with his first three throws. Later, Professor Cotton put this feat down to Nothlings habit of hurling stones across a cavern while tending cattle on the farm. He never threw the javelin again because it was too dull. intuition.’ Otto was a safe player who made his moves after slow calculation and who never let his unconscious mind take over. He gave up the game at 24, fearing injury, and later advised his son to do the same. But cricket was Otto’s first love. It wasn’t unusual in Queensland for men from northern Europe to play cricket. In 1928 Kann, Olehmann and Oelkers, represented Toowoomba, and Frauenfelder and Steinhort represented Queensland Country. And so, returning to Queensland after finishing his studies, Nothling could work his way from grade cricket to the Shield team. 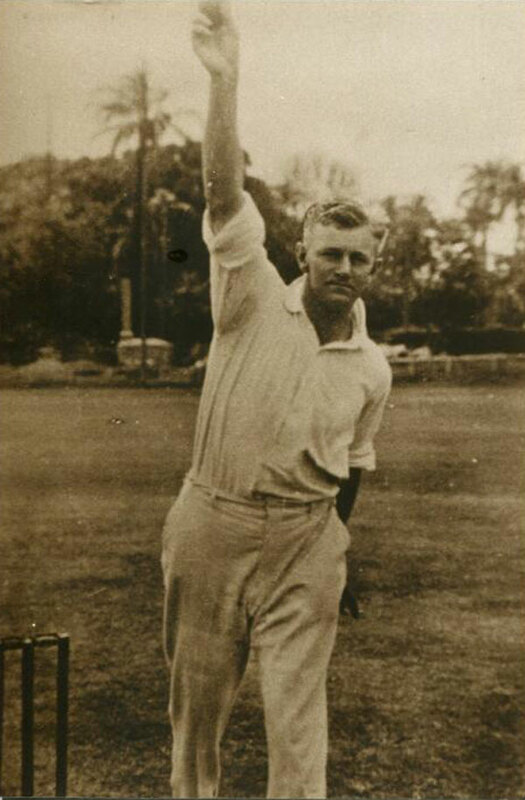 He was a fastish bowler who, according to Bill Brown, used his height to zip the ball off the wicket. Because of his reputation as an athlete, batsmen respected him. He was an aggressive bat too – good enough to score a first-class 100 and to average 28 late in his career. In November 1928 he was chosen to represent Queensland against the touring MCC team. He took five wickets for 78 runs, including those of Sutcliffe, Hammond, Tyldesley, Chapman and Ames – the cream of English batting. Then Australia, despite a brave innings of 30 by Woodfull, lost the first Test on a Brisbane sticky by the small matter of 675 runs. A youngster called Bradman batted at No. 7 and was dismissed for 18 and one. Changes had to be made. Obviously this boy from Bowral wasn’t up to it but who else could be dropped? Gregory was over the hill and Kellaway was out of form. Searching for new blood the selectors turned to Nothling for the second Test in Sydney. He didn’t do badly really. In his first few overs he rapped Hobbs and Sutcliffe on the pads and wasn’t game to appeal. In those days it was poor form to shout unless it was plumb. Later the umpire told Nothling he’d have ruled for the bowler on both occasions. Hobbs and Sutcliffe got big scores and again Australia lost. In his pomp, Nothling used to chuckle and say it could have been so different. Spectators were more sanguine. One told a neighbour to cast an eye over this Nothling character because he’d never see him again. Otto didn’t deserve that. Luckily, he had a broad sense of humour and decades later he’d begin his lectures by introducing himself as the only fellow who’d ever kicked Bradman out of a cricket team. According to the scorebooks, Otto bowled 42 overs, 15 maidens, and took no Wickets for 60 runs in England’s huge total of 656. Old-timers recall a tall cricketer banging the ball down at the wide bats of the Englishmen. With the bat he scored 52 runs, which was more than Bradman had managed on his debut. His batting was full of vigour, as Monty Noble recalled in his book on the series. Noble observed: “The athletic Queenslander played a fine fighting knock”. With Ryder, Otto forged an aggressive partnership which added 101 runs in 67 minutes. His running between the wickets also ‘caused anxiety’ and he was run out by Hendren. He never was a man for hanging about. It wasn’t enough and Nothling was dropped. Bradman returned and dominated Test cricket for the next 20 years. Nothling repaired to Queensland, played a few more games and then retired because he had to support his family and to do this he had to take his practice to Maryborough, 280km north of Brisbane. He played only 12 first-class games in his career. Otto took up golf and was quickly playing off scratch. He was soon the life and soul of the Maryborough community. During the war he served in the Red Cross in Egypt and Greece, where he survived several close shaves before being invalided out. At home he followed cricket, working as an administrator. With his limbs failing he gave up his general practice and, at the age of 50, went to Sydney for two years to qualify as a dermatologist. In Maryborough he was regarded as an eccentric. He took to driving around in a World War II jeep, dressed to the nines in a dark suit and wearing a fedora. Eventually he was elected president of the QCA and immediately set about ridding Queensland cricket of its cobwebs. He took an interest in district games and he played billiards until dawn with touring players and asked after families of his gatemen. On Saturdays he’d drive around the grade games hoping that cricket was being played properly. One hot Sunday late in 1965 Otto Nothling left the cricket to cut his lawn. Family and friends said it was too hot but Otto wasn’t a man to be deterred by things like that. He had a heart attack and his death was deeply felt. There you are. That’s what happened to Otto Nothling.